A Well-Seasoned Life: A Guest Post from Author Cynthia Kallile of "The Meatloaf Bakery Cookbook"
A Guest Post from Author Cynthia Kallile of "The Meatloaf Bakery Cookbook"
I can't think of a more perfect comfort food than meatloaf served with mashed potatoes and green beans. That's my favorite combination with extra ketchup for slathering over the meatloaf. And, now there's a cookbook dedicated to that comfort icon, The Meatloaf Bakery Cookbook: Comfort Food with a Twist by Cynthia Kallile. Cynthia owns the Meatloaf Bakery in Chicago that is serving up meatloaf in every imaginable way possible. In the cookbook, Cynthia shares recipes from meatloaf classics and meatloaves with a twist to meatless loaves and seasonal specialities. You'll also find various recipes for mashed potatoes (what would a meat loaf be without those?) and the crowning touch, the "sassy sauces". If you're a fan of meatloaf, you'll love the creative ways that Cynthia cooks meatloaf from baking in muffin tins to grilling in the from of a "loafer" kabob. Fall is the perfect season to change up your cooking routine and try a new way to cook and old family favorite, the meatloaf. I'm excited to present the following guest post by the author herself, Cynthia Kallile. For more information on the The Meatloaf Bakery, visit the web site at www.themeatloafbakery.com. 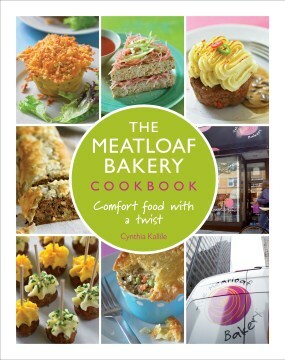 You can check out a sneak peek of the book here at: http://www.themeatloafbakery.com/cookbook/. hometown, Toledo, Ohio, was a treat, not a chore. plus years as a hobby cook, I took the plunge in 2008, and created a business around meatloaf. Quirky? Indeed! Delicious? You bet! honor of my mom and where it all began!